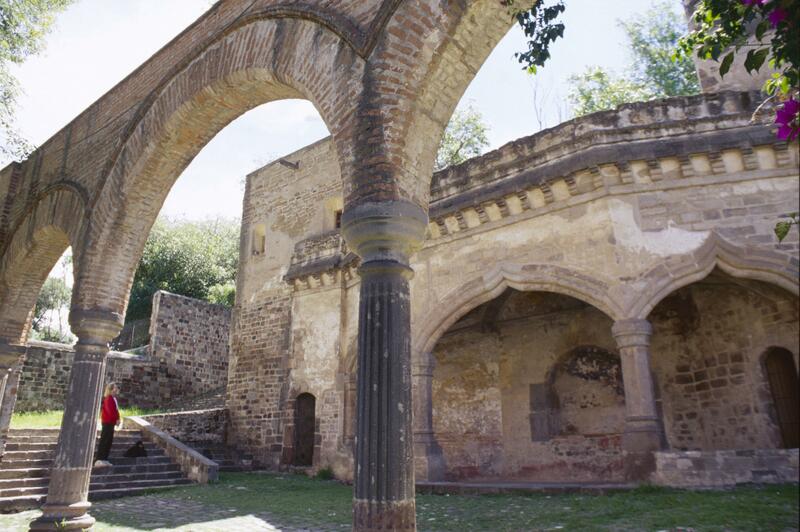 This portico-like structure, set in the back of Tlaxcala’s Franciscan monastery in Central Mexico, was used to preach to newly converted indigenous peoples in the 16th century. These “open chapels” are found in many of the churches of New Spain built by the evangelizing Catholic religious orders, the Franciscans, the Dominicans, and the Augustinians. One scholar, Jaime Lara, has argued that this space was specifically designed to house the plays that were frequently staged on religious feast days in 16th-century New Spain. In terms of their architectural style, the slightly peaked arches evoke the mozarabic, or “mudéjar” architecture that was common in Spain. Most works of 16th-century religious architecture in New Spain were designed by the friars themselves, who often drew on European prototypes. But the actual masons, carpenters and laborers who built this open chapel and the adjacent church came from the indigenous community of Tlaxcala. Typically, communities were expected to provide the labor as part of their tribute obligations. Arches, like the ones on this open chapel, were an architectural form introduced from Europe in the 16th century. Their vaulting stones had to be carefully and precisely carved to span an open space. In both New Spain and Peru, stones were taken from pre-Hispanic temples and recycled into new religious constructions. Since Tlaxcala was a thriving city before the Conquest, it is likely that some of this stone came from preexisting buildings. 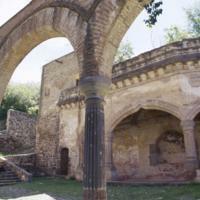 The open chapel sits at the base of the western entrance to the patio of Santa Maria Asunción, a church at the center of Tlaxcala’s large Franciscan monastery. This placement is somewhat unusual, because open chapels typically were set at the front side of the church. Through developing distinct architectural forms such as posas and open chapels, evangelizing orders like Franciscans attempted to create new spaces for public worship that would help them implant Christianity in formerly “pagan” indigenous communities. Soon after the conquest, the friars recognized that destroying old sites of worship was but one limited way of supplanting pre-conquest belief and practice. Throughout central Mexico, they also sought to replace the public festivals of pre-Hispanic religion with Catholic processions and pageants. Through the theatrical and ritual events that transpired in these new religious spaces, evangelization of native communities became a communal and public process. Artigas, H. Juan B. 1985. Capillas abiertas aisladas de Tlaxcala. Mexico City: Universidad Nacional Autónoma de México. Montes Bardo, Joaquín. 1998. Arte y espiritualidad franciscana en la Nueva España: siglo XVI: iconología en la provincia del Santo Evangelio. Jaén: Universidad de Jaén.